When you choose DECRA roofing materials from Emerson Enterprises for your project, you are giving your home the gift of ageless beauty and protection. With 60 years of roofing success to their name, DECRA is your answer to all of your roofing needs in the Kansas City area. 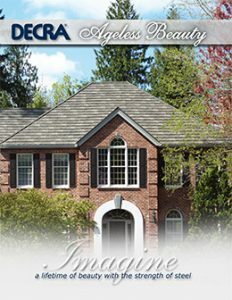 The original stone coated roofing system, DECRA takes pride in the effortless blend of practicality and style displayed through their roofing products. By offering only the best of the best when it comes to engineering design and usable performance, DECRA creates roofing systems perfect for any structure. DECRA’s unsurpassed innovation has helped to create an intricate system of roofing materials that work together to give your home protection that lasts decades longer than traditional roofing standards. The DECRA roofing system is created through the strength and durability of stone coated steel, combined with the eye-catching style of tile. Made up of eight layers, this system protects your home from high winds and other damages caused by the elements with impeccable shear strength. break, warp, curl or split, and is warranted for winds up to 120 mph as well as any damaging hail penetration. Committed to creating a sustainable line of products, DECRA makes all of their steel materials to be durable, long-lasting, and recyclable at the end of their lifespan. This leads to lessening the need of any raw materials, which helps in aiding environmental efforts throughout the world. Whether you are replacing a typical asphalt shingled roof, or simply looking to repair your existing masterpiece, stop by Emerson Enterprises today to find the DECRA roofing solution perfect for your home.